John Deere's 7 cu. ft. high-density polyethylene cart easily connects to your lawn tractor using a universal hitch. This hard-working cart has a load capacity of 450 lbs. The body won't rust or dent and is compression moulded for superior strength and durability. This cart features two vertical 3/4 in. moulded channels on each side. Pneumatic tires provide turf tread for excellent traction and the steep tailgate angle and release mechanism make the emptying process a breeze. All Columbia Yard tractors are engineered to offer premium performance and quality results. They feature a 12-gauge steel cutting deck, an extra heavy-duty frame, first-class ergonomics and a powerful engine with full pressure lubrication for years of trouble-free service. 7 cu. 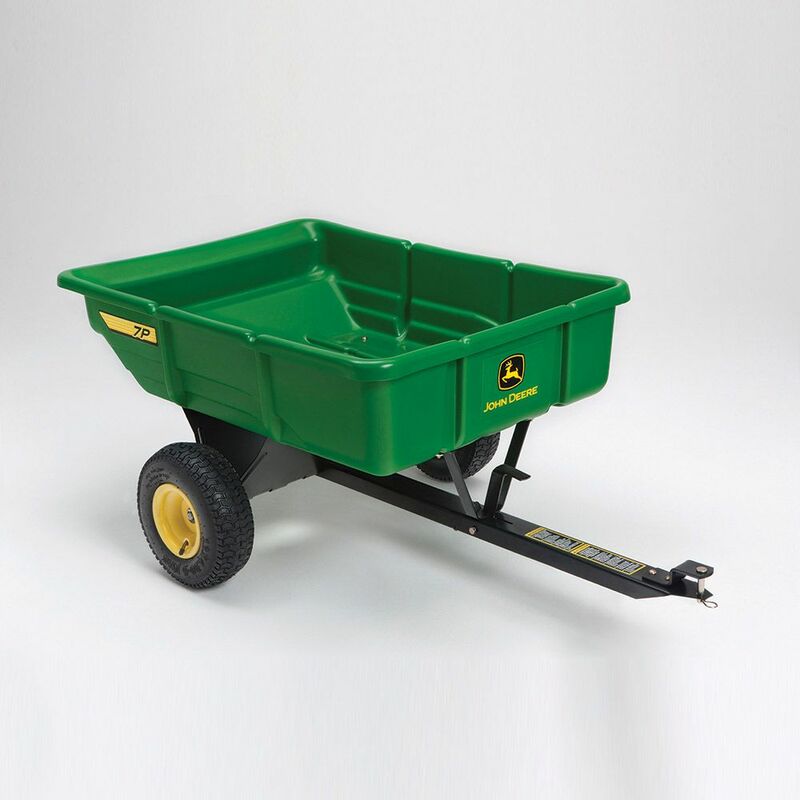 ft. Poly Utility Cart for Lawn Tractors John Deere's 7 cu. ft. high-density polyethylene cart easily connects to your lawn tractor using a universal hitch. This hard-working cart has a load capacity of 450 lbs. The body won't rust or dent and is compression moulded for superior strength and durability. This cart features two vertical 3/4 in. moulded channels on each side. Pneumatic tires provide turf tread for excellent traction and the steep tailgate angle and release mechanism make the emptying process a breeze. 7 cu. ft. Poly Utility Cart for Lawn Tractors is rated 4.2 out of 5 by 94. Rated 3 out of 5 by Qwerty from Missing the spring for the hitch release, no idea where... Missing the spring for the hitch release, no idea where I can get one. Otherwise I’m happy with it, wish there was an online store to order the parts from. Rated 5 out of 5 by Anonymous from I love my trailer!! I've been shopping for one forever.... I love my trailer!! I've been shopping for one forever. It's very sturdy but very light. Instructions were very good. Rated 5 out of 5 by Kenneth from The tong was difficult to assemble.... The tong was difficult to assemble. Rated 5 out of 5 by John from Very easy to assemble. A great accessory to move most... Very easy to assemble. A great accessory to move most everything around the yard. Rated 5 out of 5 by Birdog from Struggled a bit with installing the spring. Finally changed the... Struggled a bit with installing the spring. Finally changed the shape of the spring so it would fit and no further issues. Rated 4 out of 5 by Builderman from It's made out of plastic but boy it's stuff. I tow it behind my four-wheeler and just gun it. And... It's made out of plastic but boy it's stuff. I tow it behind my four-wheeler and just gun it. And hangs on it takes a beating and it's still going. It would be nice if you hit the thing and it dumped all the way out. I find myself having to shovel everything. Rated 5 out of 5 by HomeDepotCustomer from Works very well. The only trouble I had was... Works very well. The only trouble I had was getting the spring mechanism for locking the bed in place. I had to have help with it.